Horntails are unlike most familiar wasps. These animals do not sting nor do they form social colonies. They are also called Wood Wasps because the immature stage or grub feeds by tunneling through the wood of recently killed/dead trees. This is an ancient group found among fossils from the Mesozoic Period 150 million years ago. The specimen here is a male and lacks the specialized ovipositor of the female. 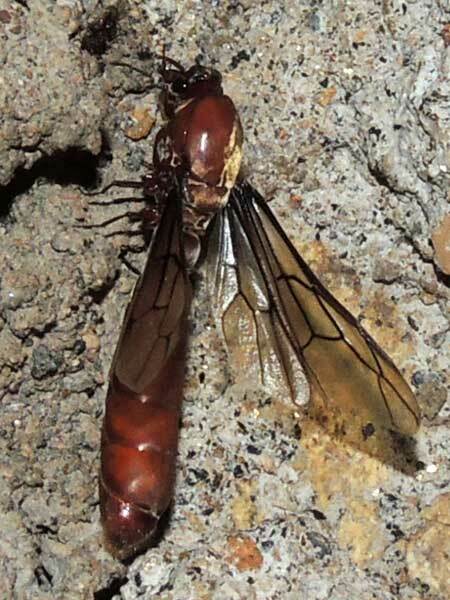 The ovipositor is protected by a long sheath and is the namesake 'horn'. The female ovipositor is a wonder of nature with its ability to penetrate solid wood to where the egg will be deposited.